Prior to working with Documents, it is important to understand how Docsvault organizes documents. The documents in Docsvault are organized into a tree hierarchy structure - cabinets, folders and files. Select the node Docsvault first, to see the list of cabinet. A plus sign next to the cabinet name indicates that there are folders in the cabinet. Click the plus (+) to expand the cabinet. This will display the folders found in the cabinet. On clicking the name of the cabinet or folder, the contents will be displayed in the list view panel. The concept of cabinets in Docsvault is similar to the traditional use of physical cabinets in your office. You can create folders and sub folders in each cabinet to keep your documents separate, safe and easily searchable. Cabinet is the first hierarchical level, it exist immediately under the Docsvault node which represents the documents repository on the server. Folder is the second hierarchy, under cabinet. Folder can contain sub-folders and files. 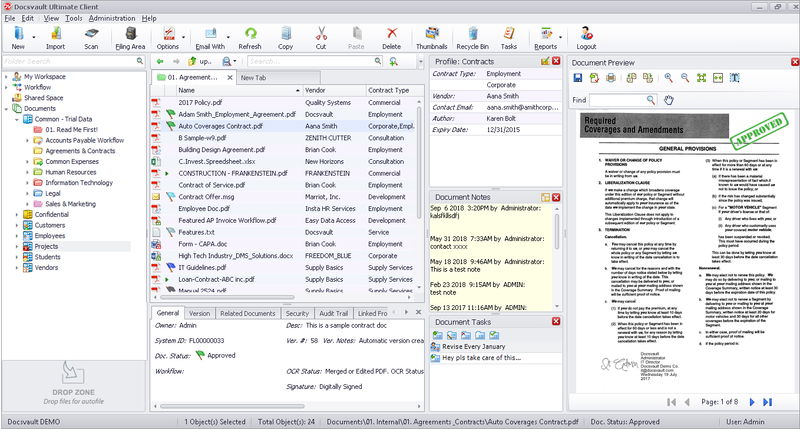 The list view panel displays a list of all documents stored in the folder that is selected in the tree view panel. Documents refer to the files stored within the hierarchical tree. You can import any type of document, like office application files, PDF's, image files etc., into Docsvault. The list view panel of the Docsvault Explorer provides a list of the files or sub-folders contained in a folder. •Permission to list, read, add, modify, or delete files, folders and cabinets depend on the security rights of the user or the group he/she belongs to. In later sections you will learn how to create, edit, delete cabinets and folders, apply custom security settings, give security rights to user or group of users and do a basic or advanced search within the document hierarchy.